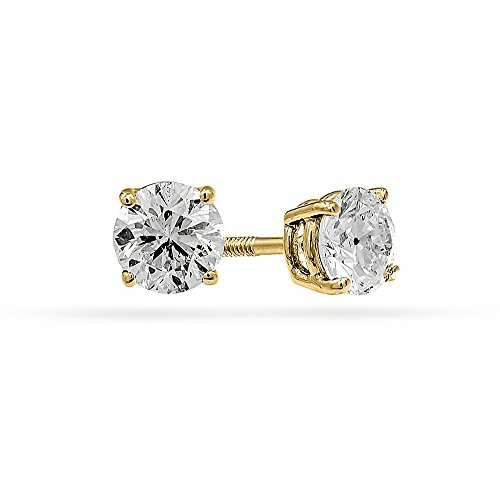 These beautiful studs are set in 14k Yellow Gold with screw backs stamped 14k SOJ. Studs will come with diamonds authenticity and Light Performance certificate all in one jewelry box. Both stones will have different Diamond ID# inscribed on the girdle which will match the GemEx Light Performance certificate. Diamond is cut in our own facility here in New York, NY with 8 cutters and checked by GIA Diamond Graduate for clarity and color. Stones are scanned for light performance, set, polished and IGI certified right here in New York, NY. All of our diamonds are 100% conflict free natural diamonds. We also offer 30 day money back guarantee so you have no worries at all. Shine On Cut vs Regular 58 Facet: Shine on cut has 97 facets to bring out more brightness, fire and sparkle of the diamond which is what everyone looks for when buying diamond jewelries while regular 58 facet diamond is sold as is. Cut for regular diamond can go from excellent cut to fair cut where excellent cut can have great light return and more expensive to fair cut with no light return and less expensive. With Shine on cut you won't have to worry about excellent cut or fair cut why because we guarantee our light performance for be 2 Very High and 1 High in Gemex light performance scale. Gemex systems is our greatest tool. Gemex BrillianceScope will evaluate from six different lighting position for the light return since diamonds are nearly always in motion as you wear them. GemEx and the Brilliancescope is your assurance that you are buying and wearing a beautiful diamond. Once the diamond is scanned from our facility, GemEx Quality Assurance Managers examine each and every scan to make sure the results are valid. Once the results are confirmed, the certificate is printed and matched with your diamond. We have worked on Shine on cut for over a year to give you the best light return performance and make you shine everywhere you go. Patent Cut - more facets mean more sparkles. Cut, Polish & Set in NY, USA. IGI NY certified: J-K I1 earrings are tagged by IGI. Gemex Light Performance - Buy a diamond that is scientifically measured for its brilliance, fire and sparkle. All of our diamond suppliers state to the best of their knowledge that any diamonds supplied to Shine On are 100% conflict free natural diamonds. If you have any questions about this product by Shine On, contact us by completing and submitting the form below. If you are looking for a specif part number, please include it with your message.